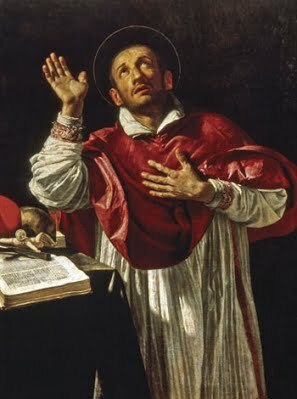 St. Charles Borromeo, Bishop - My Catholic Life! Today’s saint was born in a castle to an aristocratic family. His father was a count, his mother a Medici, and his uncle a pope. This last fact was to determine the trajectory of Charles Borromeo’s entire life. Pope Pius IV (1559-1565) was the brother of Charles’ mother. At the tender age of just twelve, Charles received the external sign of permanent religious commitment, the shaving of the scalp known as tonsure. He was industrious and extremely bright and received advanced degrees in theology and law in his native northern Italy. In 1560 his uncle ordered him to Rome and made him a Cardinal at the age of just twenty-one, even though Charles was not yet ordained a priest or bishop. This was brazen nepotism. But in this instance it was also genius. The Cardinal-nephew was a man of rare gifts and his high office afforded him a wide forum to give those gifts their fullest expression. At the Holy See, Charles was loaded down with immense responsibilities. He oversaw large religious orders. He was the papal legate to important cities in the papal states. He was the Cardinal Protector of Portugal, the Low Countries, and Switzerland. And, on top of all this, he was named administrator of the enormous Archdiocese of Milan. Charles was so bound to his Roman obligations, however, that he was unable to escape to visit Milan’s faithful who were under his pastoral care. Non-resident heads of dioceses were common at the time. This pained Charles, who would only be able to minister in his diocese years later. Cardinal Borromeo was a tireless and methodical laborer in the Holy See who nevertheless always found ample time to care for his own soul. When Pope Pius IV decided to reconvene the long suspended Council of Trent, the Holy Spirit placed Cardinal Borromeo in just the right place at just the right time. In 1562 the Council Fathers met once again, largely due to the energy and planning of Charles. In its last sessions, the Council completed its most decisive work of doctrinal and pastoral reform. Charles was particularly influential in the Council’s decrees on the liturgy and in its catechism, both of which were to have an enduring and direct influence on universal Catholic life for over four centuries. Charles was the driving force and indispensable man at the Council, yet he was still just in his mid-twenties and was only ordained a priest and bishop in 1563, in the heat of the Council’s activities. In 1566, after his uncle had died and a new pope granted his request, Charles was at last able to reside in Milan as its Archbishop. There had not been a resident bishop there for over eighty years! There was much neglect of faith and morals to overcome. Charles had the unique opportunity to personally implement the Tridentine reforms he had played such a key role in writing. He was indefatigable in implementing Trent. He founded seminaries, improved training for priests, stamped out ecclesiastical bribery, improved preaching and catechetical instruction, and combatted widespread religious superstition. He became widely loved by the faithful for his personal generosity and heroism in combatting a devastating famine and plague. He stayed in Milan when most civil officials abandoned it. He went into personal debt to feed thousands. Charles attended two retreats every year, went to confession daily, mortified himself continually, and was a model, if austere, Christian in every way. This one-man army for God died in Milan after an intense life of work at the age of forty-six, an icon of a Counter-Reformation priest and bishop. Devotion to him began immediately, and he was canonized in 1610. Saint Charles Borromeo, your personal life embodied what you taught. You held yourself and others to the highest standards of Christian living. From your place in heaven, hear our prayers and grant us what we ask for our own good and that of the Church.